The Association of Junior League International’s Kids in the Kitchen promotes child health and wellness by empowering children and youth to make healthy lifestyle choices, therefore preventing obesity and its associated health risks. 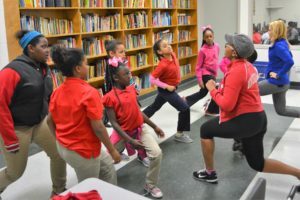 In addition to guiding participants to create healthy and flavorful foods, an activities component introduces them to various forms of exercise to encourage a continued healthy and active lifestyle. 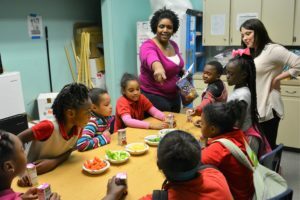 Junior League of Lafayette’s Kids in the Kitchen Committee spends two evenings each week, from September through April, teaching children from the Boys & Girls Clubs of Acadiana about healthy eating and healthy living. The Kitchen Crew introduce new foods to the participants through a variety of simple recipes with easy to follow instructions and basic ingredients. The children learn that healthy food can taste better than expected and be fun to prepare and eat. “Sushi sandwiches” with fruit and yogurt parfaits are among the most popular recipes! Upon completion of each session, a graduation dinner takes place at a local restaurant. The graduation dinner celebrates the work and learning of the participants and provides an opportunity for them to practice their learned table etiquette. Each participant is given a Kids in the Kitchen Cookbook and a t-shirt as well. An additional component was recently added to the program to teach the children the importance of maintaining an active lifestyle. The Activities Crew utilizes exercise balls and therapy bands in lessons about exercise. The children especially enjoy participating in Zumba! 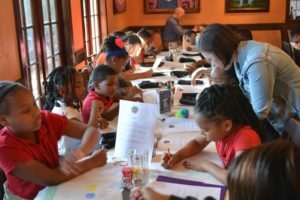 The children also learn about the importance of being healthy and physically fit from guest speakers, including former and current college athletes and players, former Mrs. Louisiana Michelle Merrill, and Kids in the Kitchen Committee members.